"Rounding another corner in the cave you are suddenly blinded by Sunlight. The Cave was hiding a Grotto. The smell of moisture, plants, and living things assails you and all your senses are tingling. You had never been to this cave, who would expect something this pretty to just be a cave you did NOT have to go into." 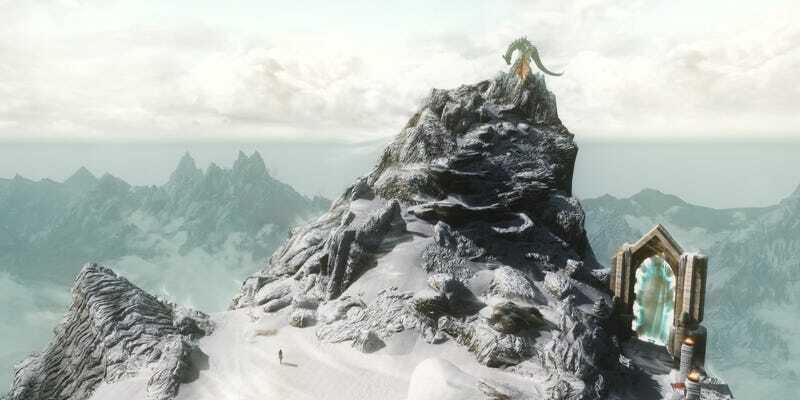 As the title, and that little blurb should tell you, I have dusted off my old copy of Skyrim and resumed adventuring, or should I say began again? I truly feel that no game has encapsulated the very essence of ADVENTURE for me as much as Skyrim has. The game is massive in scope, almost staggeringly so. What brought this on for me was actually reading You: A Novel by Austin Grossman. The novel at one point details what they feel would be a perfect game and their answer was a game that you could do anything in. This resonated with me and I thought about it quite hard. I believe one of the things that originally drew me to games was being able to feel like a part of the adventure as opposed to just reading about it. And Skyrim feels exactly like that to me. A game where I do not have to follow any questline that I do not wish to. My character could be a pickpocket, a spellsword, a lizard person, I could make my own stories within the world they presented me. Skyrim is like a blank canvas that you are presented that you paint with your actions in the game. I played HOURS and HOURS of Skyrim, both alone and with friends. We came up with stories, we created unique characters with backstories that were essentially vignettes into the world of Skyrim. Some were Earth shattering Heroes, and some were just simple people fighting for whatever they believed in. Some embraced their destinies while others fought it. Even playing it now, making a new character and setting off from Helgen felt like a choose your own adventure story. Go into the Cave, page 205. The greatest feeling of adventure is knowing that there is something out there you have not seen yet, the rush of curiosity you feel wondering what is beyond the next Hill or what is in that Cave over there. Or even simple things like being in an area during the nighttime that you had only seen in the day. The world of Skyrim felt alive to me. All the hours I have spent in the game have not dampened my curiosity and it still feels to me as if it was just a drop in the bucket as well. There are still places I know nothing about, and by the time I find everything there will be mods that add even more to the world, crafted lovingly by people who care for the adventure as much as I do. In a way an Adventure itself shared between fans, Adventuring with others. Now before I wax sentimental some more about Skyrim and completely bore everyone involved I want to know about your own Adventures. Be they in Skyrim, Dungeons and Dragons, or Pokemon. I want to know about a game that truly made you feel like an Adventurer through and through. The best Adventures are the ones shared with others. All the images were garnered from the ever impressive, and awe inspiring Dead End Thrills The Art of Gaming. Seriously go there and try not to find a new background for your computer I dare you. I do recommend the book You: A Novel quite highly.